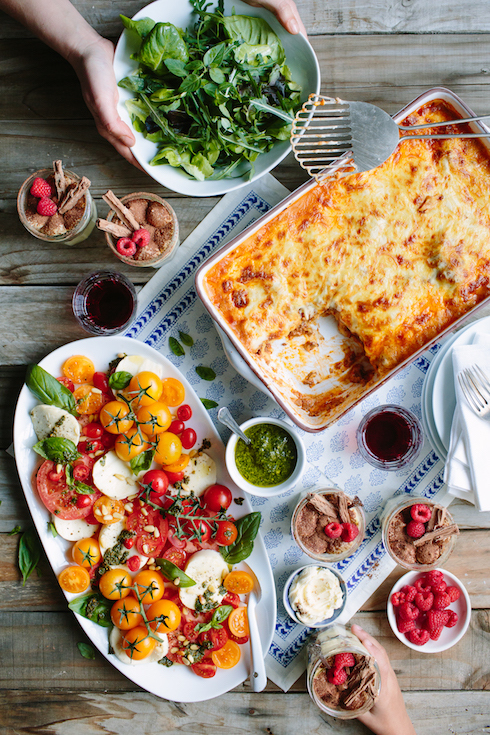 Caprese salad, triple cheese beef lasagne and individual tiramisu jars – my ultimate Italian-style feast! Photography by Tasha Seccombe. When it comes to laid-back, festive, scrumptious food that’s packed with flavour, the Italians just know how. 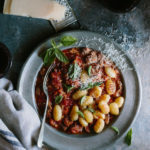 I’ve taken a few tips from their most popular traditional cheese-themed recipes to come up with my favourite three-course Italian-inspired feast: an over-the-top caprese salad, triple cheese beef lasagne (made with mozzarella, cheddar and mascarpone) and individual tiramisu cups with chocolate flakes and fresh raspberries. You can assemble the lasagne and tiramisu ahead so that you have more time to spend with your guests – the most important thing when hosting friends and family! All my recipes serve 8, because they deserve a crowd. 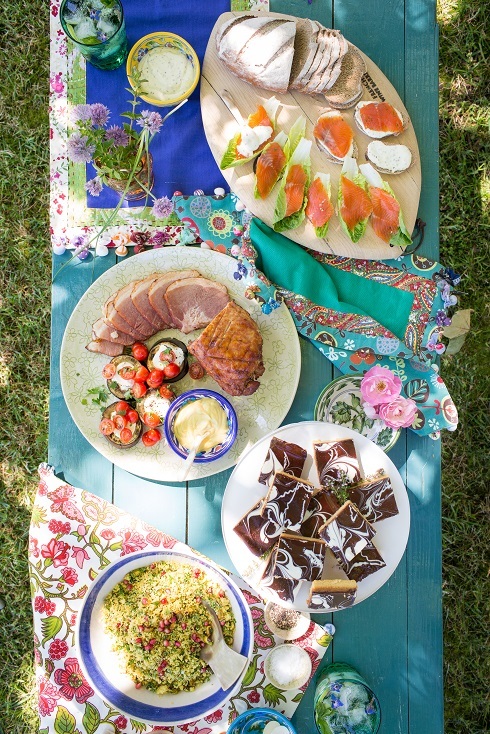 If you’re keen on a smaller gathering, just halve the ingredients to serve 4. And don’t miss my video below – it shows how to make this killer lasagne. My ultimate caprese salad with soft mozzarella, an array of tomatoes, fresh basil, pesto, toasted pine nuts, extra virgin olive oil, salt flakes and ground black pepper. Photography by Tasha Seccombe. Arrange the tomatoes on a large platter, interleaved with slices of mozzarella. Scatter with basil leaves and pine nuts, then drizzle with pesto (add a little olive oil to the pesto if it is very thick). Serve with olive oil and balsamic on the side, seasoned with salt & pepper. Serve immediately. Note: The tomatoes will wilt on standing, so this salad is best served straight after assembling. Triple cheese beef lasagne (made with mascarpone, cheddar and mozzarella). Photography by Tasha Seccombe. For the Bolognese sauce: Heat the olive oil in a wide, large pot with a heavy base. Fry the onion, carrot and celery over medium-high heat until soft and lightly brown. Add the garlic and stir. Add the mince and stir, breaking up any lumps and scraping the bottom to loosen any sticky bits. Add the rosemary and thyme. Continue to fry on high heat to brown the meat slightly, then add the red wine, stock, tomato paste, canned tomatoes, salt, pepper, sugar and stir well. Bring to a simmer, then turn heat to low, cover with a lid and cook for 2 hours, stirring every now and then. For the white sauce: Melt the butter in a saucepan over medium high heat, then add the flour and cook for a minute, stirring. Add the milk and stir with a whisk until the mixture becomes smooth and thickens slightly. Add the nutmeg, mustard and mascarpone and season well with salt & pepper. Set aside. To assemble: Preheat oven to 180 C. In a large rectangular roasting tray or oven dish, start with a thin layer of white sauce, then a layer of pasta sheets (they will swell so don’t fit them too snugly), a layer of meat sauce, more white sauce, a layer of cheddar, etc. Continue and repeat, ending with a layer of white sauce and the grated mozzarella on top. Bake for 45 minutes until golden on top, then let it rest for 5-10 minutes before serving. Note: I sometimes chop my onion, carrot and celery together in a food processor to save time. The cooked lasagne will continue to stabilize on standing, becoming firmer and easier to serve. 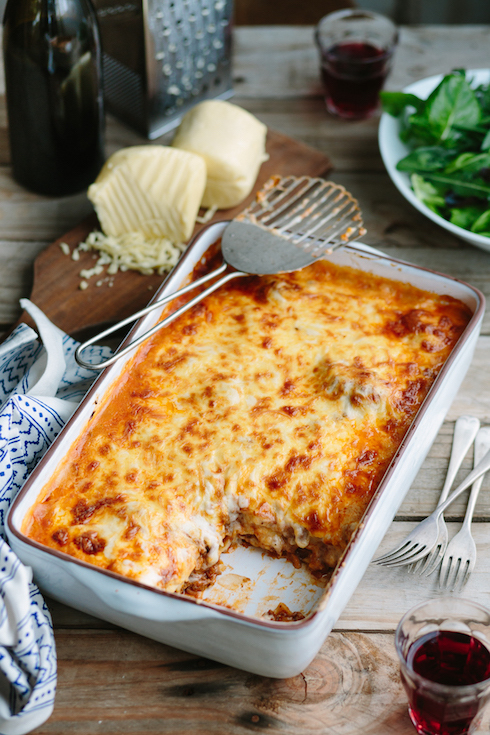 The assembled lasagne (cooked or uncooked) freezes well – thaw completely before returning to the oven. 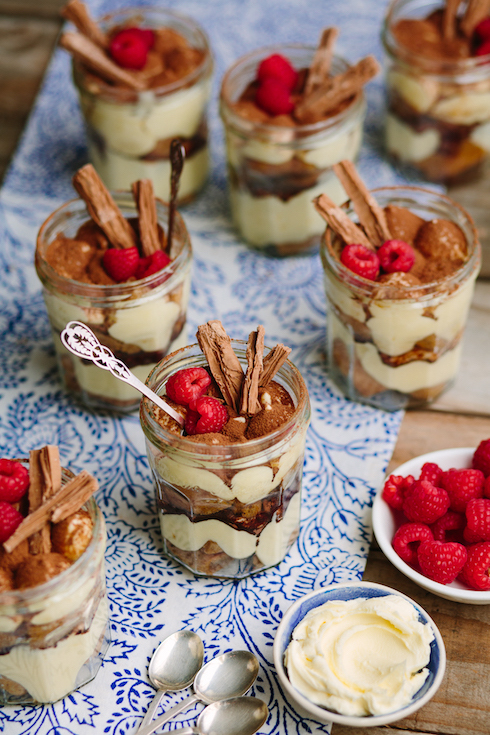 Individual jars of tiramisu, made with mascarpone, brandy and some chocolate flakes. Photography by Tasha Seccombe. Place the egg yolks and caster sugar in a large bowl. 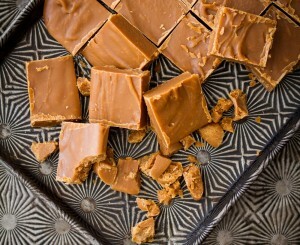 Use and electric whisk to mix until it is very thick and creamy. 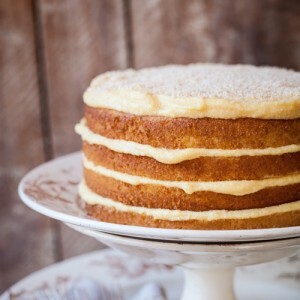 Add the mascarpone and whisk until smooth. Clean and dry this whisk, then whisk the egg whites in a separate bowl until stiff. Add half the egg whites to the mascarpone mixture and fold in with a large spoon, continuing with the second half and folding until you have a smooth, creamy, mousse-like mixture. Set aside. 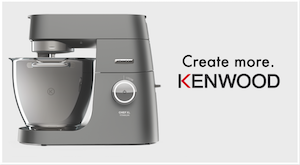 Working quickly, cut the finger biscuits into thirds, and divide the pieces into 8 groups of 9 pieces each (for 8 cups of 250 ml capacity each). Place the coffee and brandy in a shallow flat bowl, then dip 4 cookie pieces at a time into the coffee mixture, and place them into the bottom of each dessert glass/jar. Top with a dollop of the mascarpone mix, then a sifting of cocoa powder. Top with a second round of 5 dipped biscuit pieces, then place the remaining half of the mascarpone mix into a piping bag and pipe dollops of the mixture at the top of each glass to cover the biscuits. Dust some cocoa powder over the top, then cover with plastic or lids (not touching the mixture) and refrigerate for at least 3 hours. 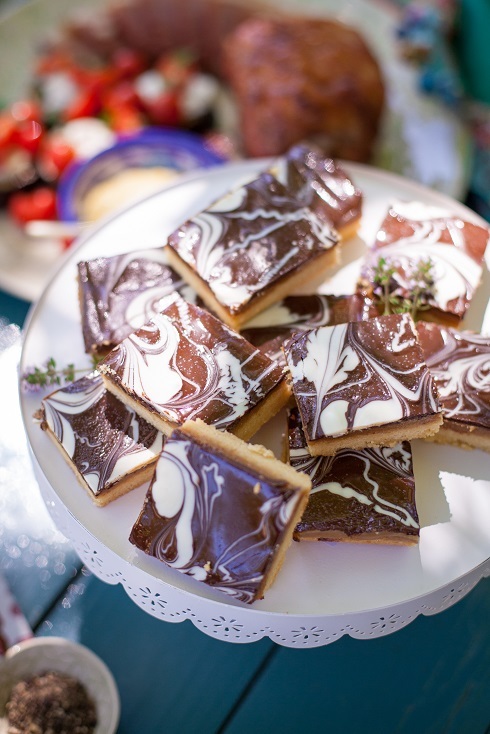 To serve, add some chocolate flakes and berries on top and serve straight from the fridge. Note: The biscuits need time to soften in the fridge. If you serve them too soon, the cookies will still be tough. The tiramisu cups keep very well in the fridge for up to 3 days and the flavour improves with time. A few weeks ago I had a lovely wine tasting at Babylonstoren. 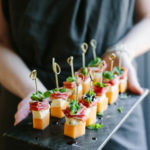 They serve the most delightful snack platters at their tasting room, packed with fantastic fresh produce from their breathtaking, abundant gardens as well as a selection of locally sourced charcuterie and cheeses. It’s totally worth a visit and great value for money. One of the most memorable items on these snack platters was a jar of marinated baby tomatoes. I assumed that they were slow roasted because of the intense flavour, but after enquiring about them the management confided that they were simply marinated overnight in a mixture of lots of red wine vinegar, olive oil and fresh herbs. I decided to give it a go at home, and after marinating a jar overnight I served it with a few greens, some shaved multicoloured raw beetroot and a few slices of crottin (goats cheese). What a magnificently colourful picture! I loved the crunchy, earthiness of the beetroot, the tang of the crottin and the bursting sweetness of the tomatoes. 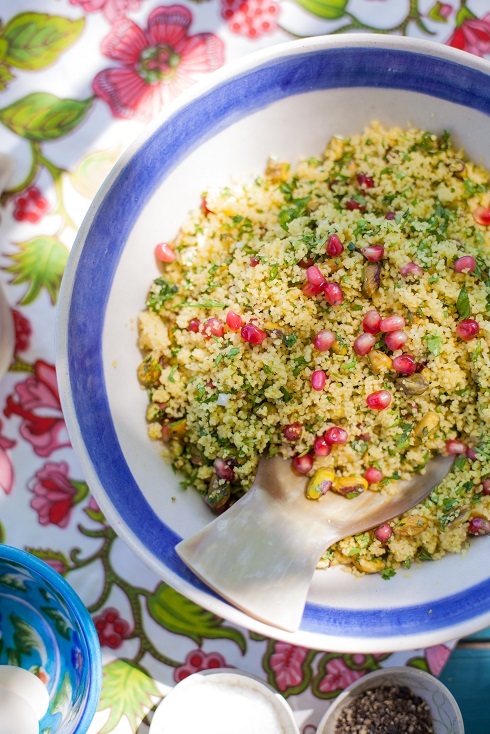 Such a stunning looking salad for summer entertaining. Place the tomatoes, rosemary and garlic in a 500g glass jar. Add the vinegar and oil and season with salt & pepper. Close the jar and tilt it over to mix all the ingredients. Refrigerate overnight to marinate (or for at least 6 hours). 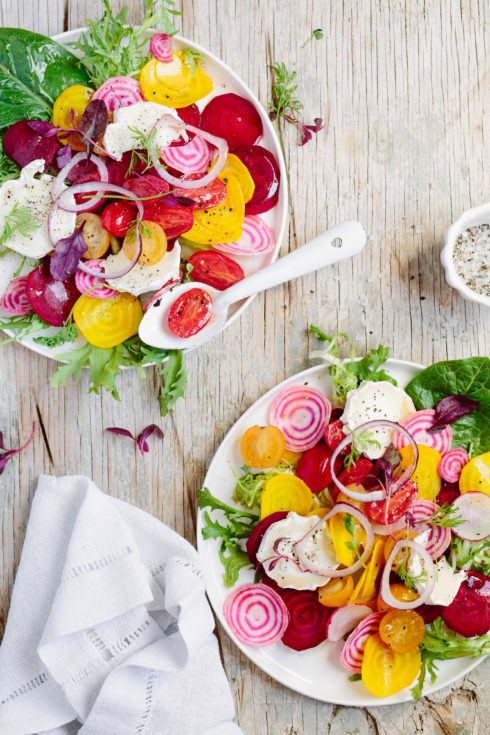 Arrange the leaves, beets, radishes, red onion, crottin and tomatoes on a salad platter or on individual plates. Top with micro herbs and dress with the tomato marinade. Serve immediately. A few weeks ago, I had the privilege of joining labneh cheese maker Shelly Zaidman at Fairview for a look behind the scenes at their manufacturing plant, and a taste of this new product range. Fairview Labneh is a soft white, medium fat Mediterranean style cheese made from strained yoghurt (100% Jersey cow’s milk), which gives it a fresh acidic taste and a smooth consistency, much like smooth cottage cheese. Shelly is originally from Israel, but moved to Cape Town with her husband and three young kids a few years ago. She started making labneh for her family after not finding a suitable soft fresh cheese in SA for their household use. After some friends tasted it, she realised how popular it was with locals alike, and started selling it on a small scale. Soon, she hooked up with the people at Fairview to start producing it on a bigger scale, and her labneh is now available in many large retail stores. 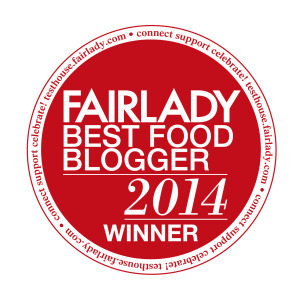 In December last year, I had the pleasure of working with The Pretty Blog team on an official recipe development project for Fairview Labneh. 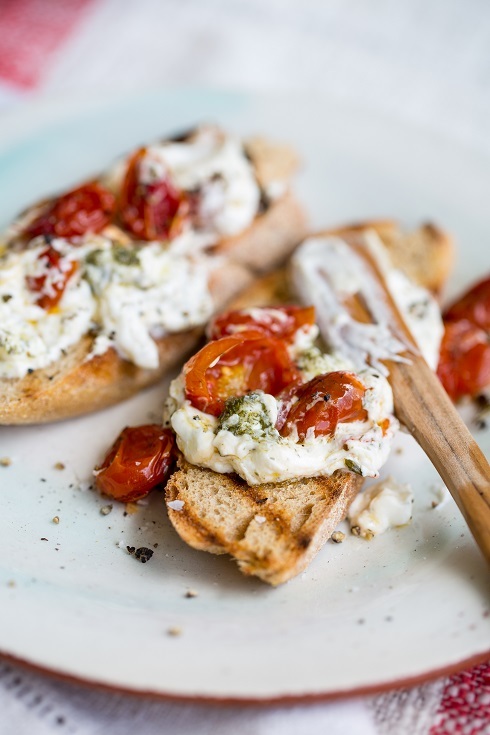 Although labneh is such a versatile dip on its own, the sweetness and texture of Mediterranean-style slow roasted tomatoes just enhances all of the creamy and tangy qualities of the cheese. 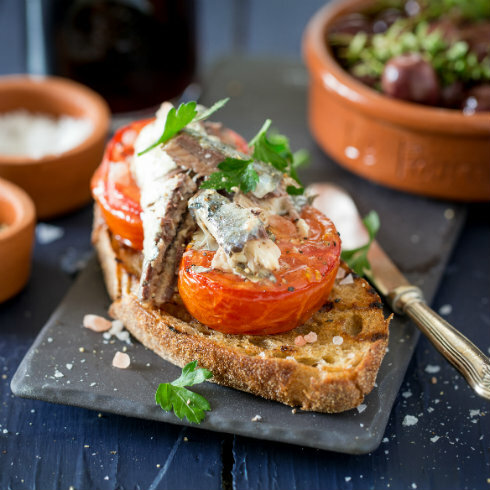 This simple recipe is my favourite way of enjoying labneh: spread generously on bruschetta, topped with these slow roasted tomatoes. Fairview’s labneh is available in two flavours: 1) Garlic & Herbs and 2) Za’atar. Woolworths also stocks a version with red pepper pesto. Very delicious! In a small/medium size roasting tray, add the tomatoes & garlic. Drizzle with olive oil & vinegar, then sprinkle with thyme, brown sugar, salt & pepper. Toss to coat. Roast for 50-60 minutes, or until the tomatoes at the edges start to turn dark and sticky. Remove from the oven and leave to cool completely. 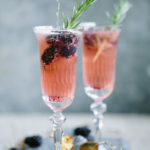 Remove any hard thyme twigs. Place the labneh in a medium size dip bowl. Add the tomatoes and swirl slightly. Serve with good quality bread. These days, most of us have access to great bread. Here in my hometown of Stellenbosch I can buy a large loaf of freshly baked sour dough bread any day of the week at Schoon de Compagne, and I use it in so many ways. The Italians have great ways of using stale bread. They make fantastic soups, salads, meat dishes and even puddings with it – economical and oh so tasty. 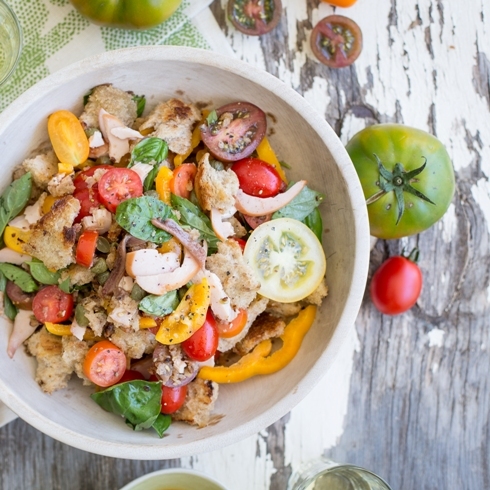 One of my favourite Italian inspired ways of using a stale loaf is to make panzanella, a traditional summery Tuscan salad of bread and tomatoes. There are many versions of panzanella, but mine contains tomatoes, yellow peppers, capers, basil, red onion and smoked chicken. And here’s a handy tip: if you want to give your panzanella an authentic Italian look, don’t cut the bread, rather break it into chunks. This way the salad has so much more character. 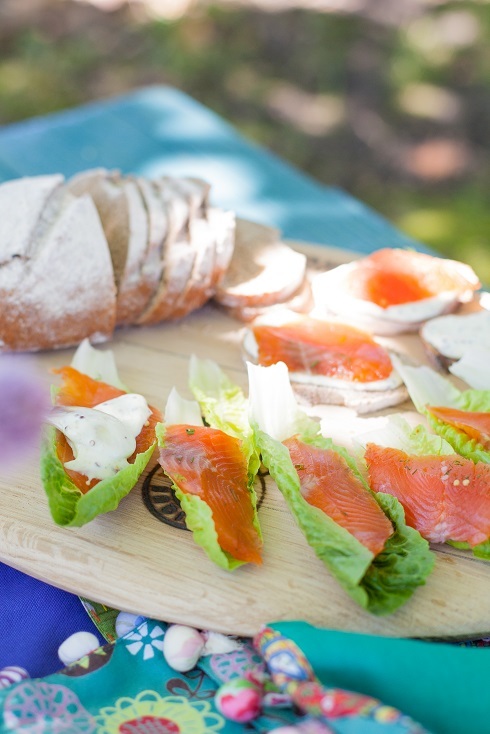 It’s a meal on its own, but don’t be afraid to serve it as one of many dishes on a lazy, extended, weekend lunch with lots of great wine in a shady spot under the trees. For the croutons: In a large pan over medium-high heat, add the oil and then toast the bread chunks until they are golden brown on all sides. Toss often until ready, then remove from heat and set aside to cool. For the dressing: mix all ingredients together in a cup, using a fork to whisk. Set aside. For the salad: in a large mixing bowl, add the croutons, chicken breast chunks, sliced tomatoes, sliced pepper, capers, red onion and basil. Pour half the dressing over the salad, then mix well. Add more dressing according to taste – I like it when the bread absorbs a lot of the dressing, resulting in a softer tangy chew. 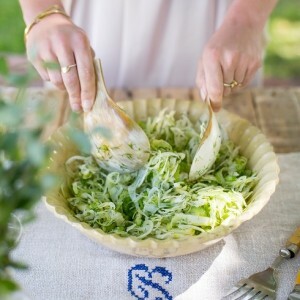 Transfer the mixed salad to a beautiful salad bowl, and serve immediately. Note: If your loaf of stale bread has a very hard crust on the outside, cut it off before tearing the bread into chunks. I’m a huge fan of Spanish food, and it has always been a life long dream of mine to visit Spain with my husband as part of an extended Mediterranean food-travelling mission. I’m longing to experience authentic Spanish, Italian, and French cuisine right there where it all started. 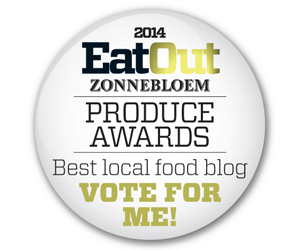 I want to meet the local farmers, producers and shop keepers and I want to eat with them. 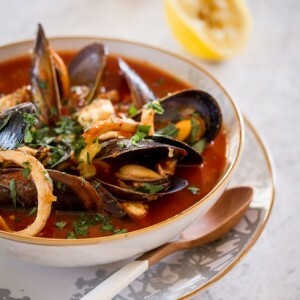 When I think of Spanish food, I always think of traditional tapas like jamón, prawns and squid, but also of paella (especially seafood paella) and gazpacho. 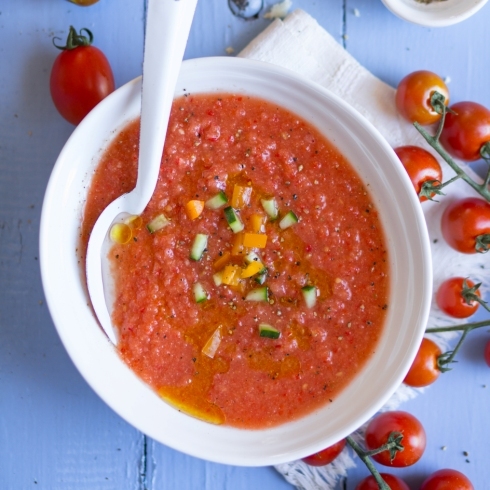 Gazpacho is a fantastic cold soup for summer, made with tomatoes, peppers, stale bread, olive oil and vinegar. It is texturally just a joy to eat, and a perfect starter to an extended Spanish summer dinner party. 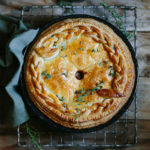 It is always best to chill it for a few hours in the fridge in order to give the flavours time to release their magic – it is even better the next day, and the next. So make it ahead of time and serve ice cold. The beauty of gazpacho, to me, lies in choosing perfectly ripe bright red tomatoes. Don’t use pale pink tomatoes that have been refrigerated for a few days, I find that they lose quite a bit of flavour that way. Rather leave your tomatoes on the counter for a day or 3 to ripen fully before you make this soup. That way you will have maximum flavour – it really does make a difference! *To skin your tomatoes, use a sharp small knife to cut a shallow “x” on the bottom of each tomato. Heat a large pot of water to boiling point, then drop the whole tomatoes into the boiling water for about 30 seconds to 1 minute. 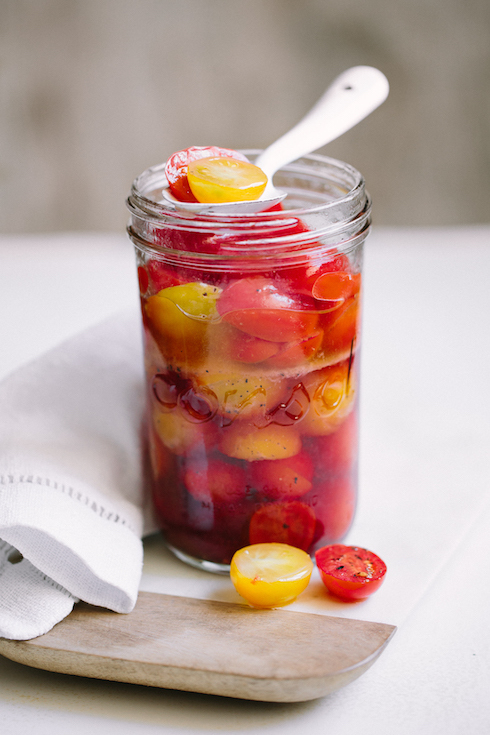 Quickly remove the tomatoes with a slotted spoon and drop them into ice cold water. Now peel off the skins (they should come off easily) and set aside. Roughly chop the tomatoes, pepper, cucumber (optional), and bread into large chunks. Place in a food processor with the garlic, chilli, olive oil and vinegar. Process to a relatively smooth liquid, leaving just enough texture to your liking. I prefer my gazpacho a bit smoother than most people, but it’s up to you! Season generously with salt and freshly ground black pepper, and add more vinegar or oil if necessary. Transfer to a suitable container for your fridge, then refrigerate for at least 4 hours or preferably overnight. The flavours will develop over time. Serve ice cold, with an extra garnish of chopped tomato, peppers or cucumber and a swirl of extra virgin olive oil. Note: The gazpacho in the photograph was made without cucumber. I sometimes add it, and sometimes don’t. The cucumber gives a great lightness to the soup, but if you prefer a deeper red colour, just leave it out. This Friday we’ll be celebrating Women’s Day – a day where we are reminded that women played a big role in South Africa’s human rights history. Back in 1965, a group of very brave women staged a silent march in Pretoria in front of the Union Buildings, against legislation that required African people to carry a special identification document which curtailed an African’s freedom of movement during the apartheid era. It’s amazing how far we’ve come since 1965. Today, Women’s Day celebrates the respect, love and appreciation of women throughout South Africa. To me, it is not a political day, it is a day where we can treat each other with a little extra care and indulgence, just because we deserve it! With the help of Poetry stores, I chose a recipe from the amazing book The Italian Cookery Course by Katie Kaldesi (available from Poetry). 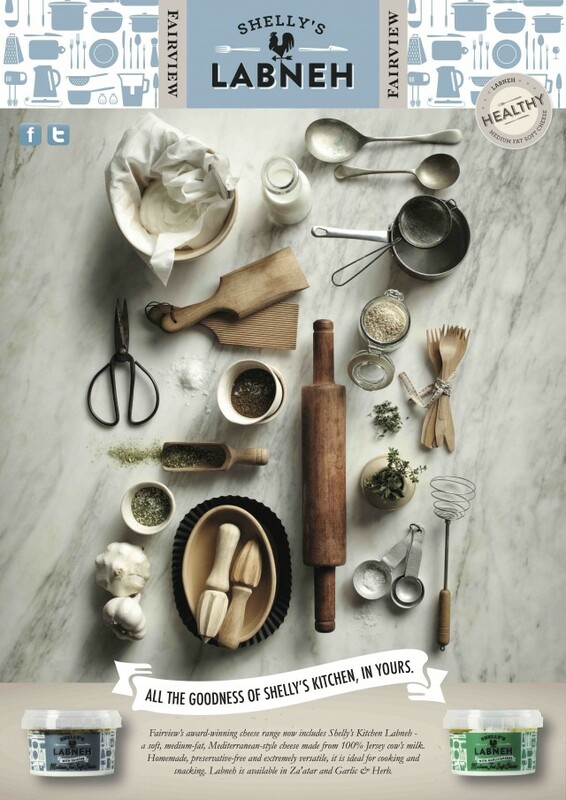 Being very sceptical of Italian cookery books (because everyone claims to cook like the Italians! ), I approached this book with caution. But after spending a few minutes paging through the beautiful recipes and stories, I realised that this book is very authentic. I just couldn’t put it down. It might be my favourite recipe book of 2013 so far – a real inspiration for anyone who really enjoys traditional Italian recipes and ingredients. Katie Caldesi was nominated for many awards after writing this book, and I can see why. 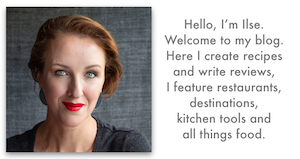 She captures the soul of the people that feature in the book, and it translates onto the recipe pages. I look forward to spending much more time with this amazing book, and I’ll surely feature more recipes in the near future. 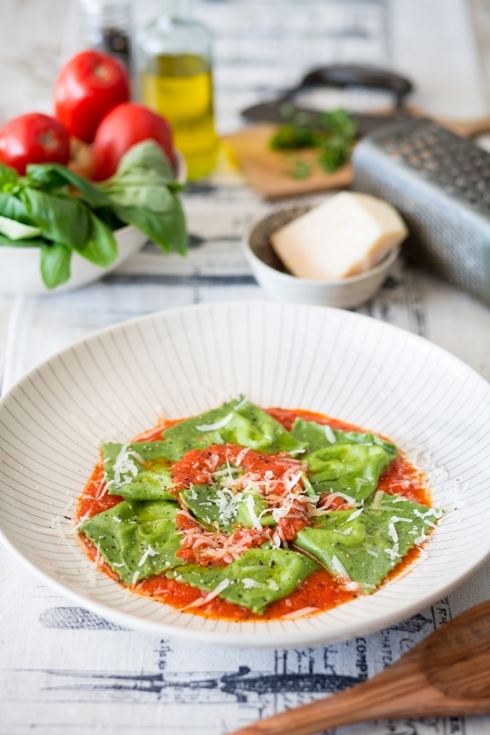 The recipe that I chose to feature for Women’s Day from The Italian Cookery Course, is part of a masterclass feature in the book: “Spinach pasta stuffed with smoked mozzarella with fresh tomato sauce”. It’s a bright green spinach pasta, filled with smoked mozzarella cheese and ricotta, topped with Giovanna’s fresh tomato sauce and freshly grated parmesan cheese. It is simply sublime in flavour, rich from the cheese filling, yet light from the fresh tomatoes in the sauce. It is a beautiful plate of Italian goodness, perfect for a Women’s Day celebration. May every lady out there feel special on Friday. I love being a woman! Put the tomatoes, basil, and onion in a large heavybased saucepan over medium heat (no oil!). Cover the pan, shaking it frequently, and leave on the heat for 45 minutes until the tomatoes have released their juices and softened. Remove the basil leaves. 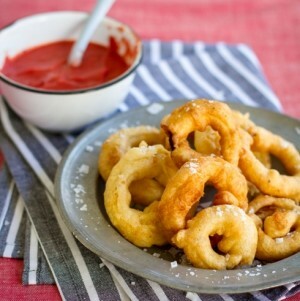 Use a stick blender and whizz up the tomatoes to a smooth puree, skins and all. Heat the oil in a pan and add the garlic. Fry over medium heat until it becomes fragrant, then add the pureed tomatoes. Bring to the boil, then simmer uncovered for 30-45 minutes until the mixture has reduced and the flavour has become concentrated. Season to taste with salt, pepper and sugar. In a mixing bowl, mix all the ingredients well. Be careful with the salt as the mozzarella is already salty. Cook the spinach first: I like to sautee the spinach leaves with olive oil in a large pan until it has wilted, then remove from the heat and let it cool. Spinach will lose about 50% of it’s weight after being cooked, so we are looking for about 100g cooked spinach for the rest of the recipe. When the spinach has cooled, place it in a small mixing jug with one of the eggs, then blend with a stick blender to a smooth green paste. Add the flour, remaining egg, and green paste to your food processor, then mix until you get a ball of dough that starts to come together (it only takes about 20-30 seconds). Remove the dough from the processor bowl, then place it on a floured wooden board and press together into a ball. Wrap in clingfilm and leave to rest for 20 minutes. Using a pasta machine, roll out the dough, one piece at a time, to a thickness of about 1mm (almost thinnest setting). Lightly dust the pasta while working with it. Lay out the sheet of pasta on a lightly dusted surface to prevent sticking. Place heaped teaspoons of stuffing on one side of each sheet (lengthways), then fold it over and press down to stick the 2 layers together. 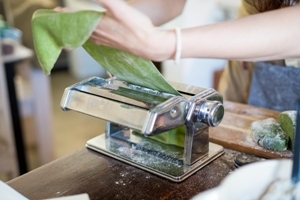 If your pasta sheets look dry, use a pastry brush and water to make the surface a bit sticky before folding it. Make sure to press out any air bubbles around the stuffing. 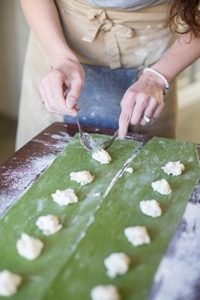 Use a fluted pastry cutter (or pizza wheel cutter) to cut the ravioli into squares, aiming to leave about 2cm between the end of the filling and the edge of the pasta square. 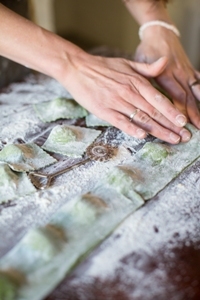 Place the ravioli on a lightly floured tray, spaced apart in a single layer. Set aside until ready to cook, but not longer than an hour otherwise it will start to stick to the surface. You can also freeze them at this stage. Bring a large pot of salted water to the boil. Cook the ravioli for 3-5 minutes (until al dente), then drain through a colander – the filling will completely melt on the inside, so don’t be alarmed if the ravioli look “deflated”, just handle with care! 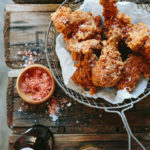 Serve with the fresh tomato sauce (see recipe above) and top with grated parmesan cheese. 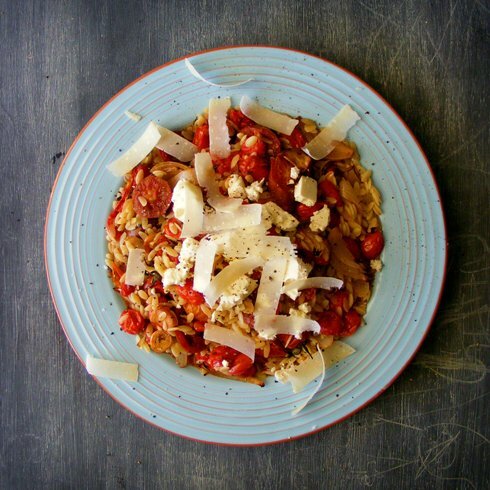 Orzo with roasted tomatoes, leeks, onions, garlic and feta, topped with parmesan shavings. My good friend and fellow blogger Jane-Anne Hobbs recently published an outstanding recipe for a Greek roasted lamb dish with orzo, “Mike’s Youvetsi”. She made this dish for us at her house last year, and I have since completely fallen in love with orzo as an ingredient. It’s got something to do with the mouthfeel of the orzo – to me, it is much more than flat rice-shaped pasta. Last week I attended a function at the V&A Waterfront where we were served the most delicious buffet lunch (#DiscoverDelicious). One of the dishes included a rice dish with roasted butternut, peanuts and danish feta. It reminded me of how fabulous a meatless dish can be if served with really flavoursome roasted ingredients and just the right type of starch. I longed for Jane-Anne’s orzo dish (it truly is spectacular, especially if you’re a fan of lamb), but decided to go the meatless route for a quick roasted tomato & orzo dish with added leeks, onions, garlic and thyme. The roasted tomatoes are also fabulous as a topping on freshly baked bread, but I decided to toss it with freshly cooked orzo topped with chunks of feta for a Greek inspired dish. 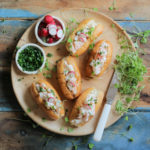 This can certainly be a meatless main course, but I think it will be fantastic served at room temperature as a side dish on a buffet table. I used only 250 g orzo, but you can certainly use up to 500g for this recipe. It is very rich in flavour and such a satisfying dish! Freshly roasted tomatoes, onions, leeks and garlic with thyme. 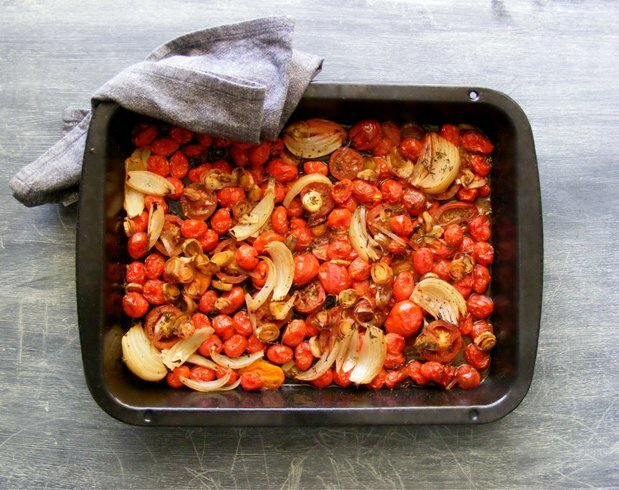 Arrange the tomatoes in a large roasting tin. Slice the bigger tomatoes, but leave the small ones whole. Add the sliced onion, leeks, garlic, thyme, then drizzle with the olive oil and balsamic vinegar. Sprinkle with the sugar, then season well with salt and pepper. Roast for 25-30 minutes at 200C until the tomatoes and onions are soft and slightly charred. Remove from the oven and set aside. Cook the orzo in a pot of rapidly boiling salted water until tender – about 7 minutes. Drain and drizzle with a little extra virgin olive oil. Add the cooked orzo to the roasted tomatoes and mix well. Transfer the contents to a suitable platter or large bowl, then top with the feta and parmesan cheese. Every time I eat linguine or spaghetti with a basic basil pesto, I feel very Italian – in a “pretend” kind of way. It is the opposite of what we grew up on in South Africa, believing that pasta always needs a chunky, heavy meat sauce. This simple way of enjoying pasta is synonymous with my motto for the new year, keeping things uncomplicated, yet robust. The most basic meal can turn into something fabulous if you use fresh, great quality ingredients, and do as little to it as possible. 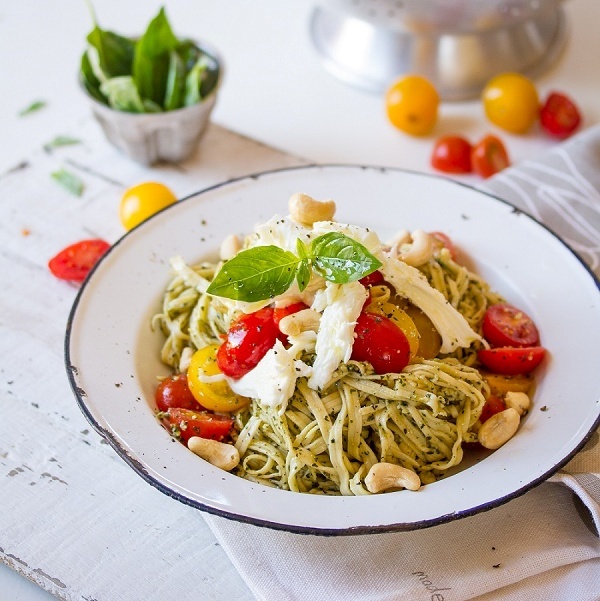 For this recipe, I varied from the well-known classic basil pesto with the use of cashew nuts instead of pine kernels – a slightly more economical choice which means that you don’t have to use the nuts too sparingly and can add some as a final topping for extra texture. Cashews still provide a strong nutty flavour, and is in no way a compromise. I also added some fresh halved cherry tomatoes, which I tossed through the pasta while it was still piping hot. The tomatoes warm up slightly, but retain their fresh crunch and flavour. 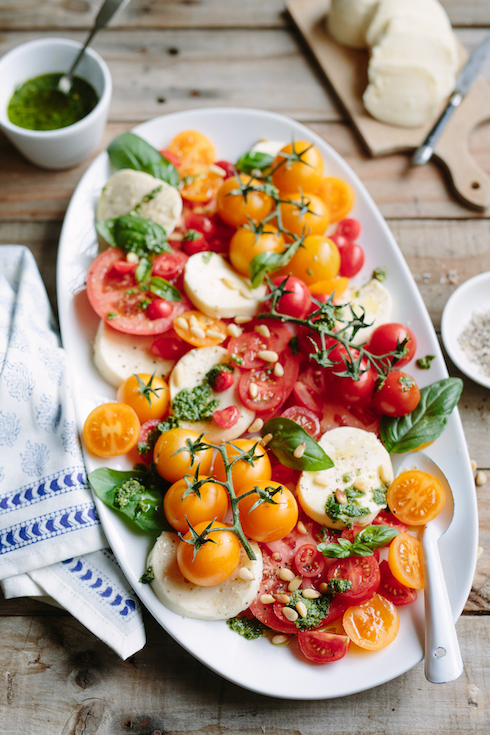 As a last addition, I also added shreds of fior di latte – wonderfully mild and milky pieces that work so well in the traditional caprese salad of tomatoes, basil and mozzarella. 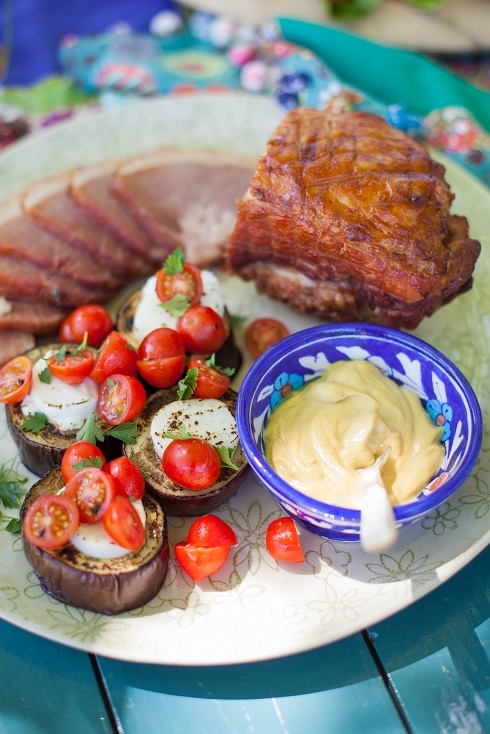 This dish makes me feel rejuvenated, inspired and longing for travels abroad. Buon appetito! In a food processor or electric chopper (or manual pestle & mortar), process/pound all ingredients for pesto together to a chunky paste. Set aside and start making pasta immediately, otherwise discolouration might occur. Bring a large pot of salted boiling water to the boil, then cook pasta for 7 minutes or until al dente. Drain in a colander and immediately add olive oil, then toss to coat. Transfer to a large bowl. Add pesto, then toss to coat well. Now add tomatoes, mozzarella and cashews. Toss again, then serve immediately with some extra olive oil on the table. Note: If you want to keep the pesto from discolouring, blanch the basil leaves in a large pot of boiling water for no longer than 3 seconds, then remove with a slotted spoon and immerse in ice water immediately. Continue making pesto as above, then transfer to an airtight container and top with a thin layer of olive oil before storing in the fridge, covered. Will keep for about 3-4 days, perfectly green. 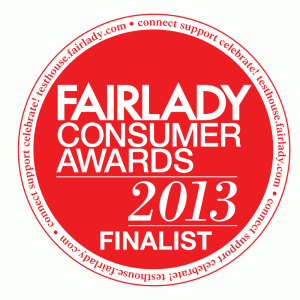 WIN with SPAR Freshline! 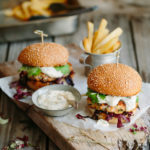 One lucky reader can win SPAR vouchers to the value of R200 when you answer this easy question: Name one ingredient/product from the SPAR Freshline range which featured in this recipe. Leave your answer as a comment at the bottom of this post. Winner will be notified on Friday the 18th of January 2012. 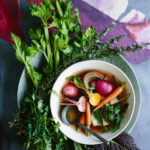 Food: Ilse van der Merwe from The Food Fox. Styling: Tasha Seccombe & NicolaPretorius.